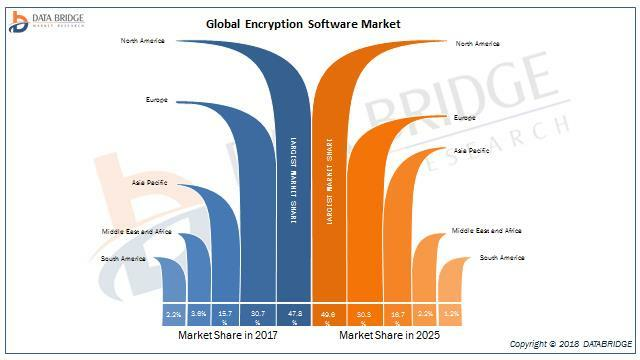 The Global Encryption Software Market is expected to reach USD 28.91 billion by 2025, from USD 4.17 billion in 2017 growing at a CAGR of 27.40% during the forecast period of 2018 to 2025. The upcoming market report contains data for historic year 2016, the base year of calculation is 2017 and the forecast period is 2018 to 2025. Dell, Eset, Gemalto, Mcafee, Microsoft, Pkware, Sophos, Symantec, Thales E-Security, Trend Micro, Cryptomathic, Stormshield, Symantec Corporation, Bloombase, Cisco ystems, EMC Corporation, Proofpoint, Check Point Software Technologies, IBM Corporation, Intel Security, Bitdefender among others. The Global Encryption Software Market with figures as forecasts up to 2025 provides an overview of the industry including its definition, size, share, growth, applications and manufacturing technology. Report also explores the major industry players in detail as well as company profile, product specifications, capacity and production value. Encryption is a process in which the information (data) is converted into codes by the service provider to block any unauthorized access. The data has to be secured and that data may be present in any kind of electronic devices. Every person and business firms has their personal information including data, that may vary from emails to WhatsApp messages and bank details that are to be kept secure between the parties involved which are involved in the transaction. This process is done by scrambling, the information is sent via electronic length codes that are unreadable by anyone else those who attempt to access these information. Once the information is sent by the sender in the form of codes, then this information can only be decrypted by the sender or the receiver for it to be in readable conditions. In 2018, Dell introduced a data security system, which is used for policy based encryption, self-encrypting drive management and bit-locker management. Market Diversification: Exhaustive information about new products, untapped geographies, recent developments, and investments in the Encryption Software market. The global encryption software market is highly fragmented and the major players have used various strategies such as new product launches, expansions, agreements, joint ventures, partnerships, acquisitions, and others to increase their footprints in this market. The report includes market shares of encryption software market for global, Europe, North America, Asia Pacific and South America. In 2018, IBM innovate a new cloud-ready mainframe, which is applicable for robust security, powerful analytics and better performance for intensive data loads.